Tired of living with low back and neck pain? Charles M Cochran DC has over 30 years experience in relieving musculoskeletal disorders. His unique recipe of combining computerized light force Adjustments, decompression, physical therapy, and rehabilitation results in safe and effective affordable care. Dr. Cochran 's Friendly and caring staff can offer same-day appointments with minimal waiting times. Give us a call to see if we can help. Consultations are always free! 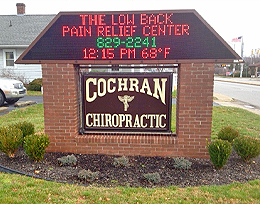 Contact Cochran Chiropractic today at 812-829-2241 for more details. We look forward to hearing from you.